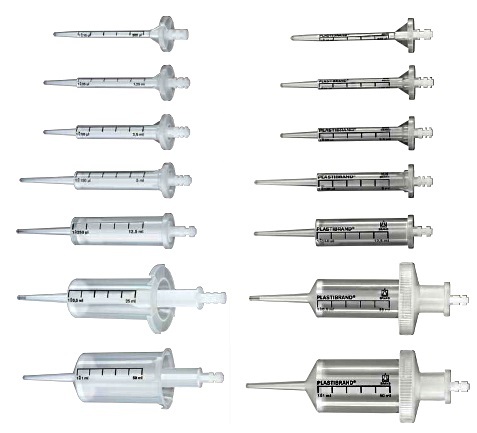 The ratiolab® Syringe-Dispenser Tips are designed for use with Ratiolab Dispetta, Wittopette Repeater, Labnet Repeater, Eppendorf Manual Repeater and Eppendorf Multipette 4780 dispensers. Syringe-Dispenser PD tips with Typ-Code are designed for use with Brand Handy-Step® and Handy-Step Electronic, ratiolab® Dispetta, and Eppendorf Multipette® 4780 dispensers. With the Handy-Step Electronic the volume of the dispenser tip is automatically identified. Adapters for 25 mL and 50 mL syringe dispenser tips must be ordered separately if not originally supplied with the intended device. Sterile tips are all individually packaged.